To use Body Browser, you'll need a Web browser with WebGL support. Google Body Browser has a search function, that lets you locate any part of the body by just typing in the name. You can expose different systems, such as the skeleton and internal organs. The app doesn’t requires any plug-ins, Flash, or Java. It runs right in any WebGL supported browser. It just requires a browser, such as the beta version of Chrome, with WebGL. It shows a 3D model of a female that can be rotated and zoomed in and out. 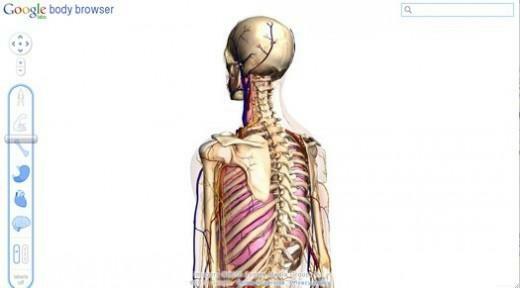 Once you’ve got a compatible browser, visit the Body Browser home page to see the human body. There you can adjust the various layers of skin, muscles, tissues, and the skeletal system. The app supports multitouch so users of trackpads or multi-touch mice can zoom in with ease. It proves to be a useful app for the healthcare industry, educators, and students. © 2010 Google - Send feedback - Imagery © 2010 Zygote Media Group, Inc.